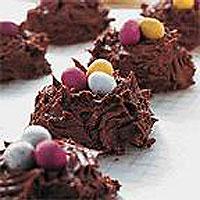 These Easter nest cakes are a great way to get children baking, and make lovely presents. They are really quick and easy to make, leaving you more time to enjoy all that Easter has to offer. Enjoy the look on little one's faces when you serve these up as a treat. Preheat the oven to 200°C, gas mark 6. To make the cakes, line a 12-hole bun tin with paper cake cases. Put the margarine in a large mixing bowl and add the sugar, egg and sifted flour. Beat with a wooden spoon or an electric whisk for 1 minute until pale and fluffy. Stir in the orange rind and juice. Spoon the mixture equally between the bun tins and bake for 10-15 minutes, until risen and golden. Remove the cakes from the tin and cool on a wire rack. To make the butter cream, put the margarine in a large mixing bowl and sift in the icing sugar. Beat well until combined, then stir in the melted chocolate. Place one of the cakes on a board and coat the sides and the top with the chocolate butter cream. Using a fork, make the icing into a nest shape and give it a rough, twig-like texture. Make a slight well in the top. Repeat with the remaining cakes and butter cream, and sit three of the mini eggs in the well of each cake.